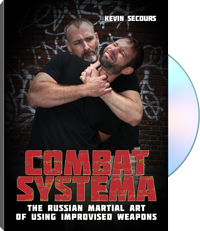 Combat Systema: The Russian Martial Art of Using Improvised Weapons presents Secours' combative system for the use of improvised weapons. Adaptability was an essential concern for the founders of Systema, and the first principle taught in this system is an understanding of the limitations of things that can be used as improvised weapons. Not every item is usable or effective as a weapon of opportunity. The second principle is that you have to learn how to use these items without relying on them, but rather on your main core of defensive techniques. If you are not a good fighter, the addition of an improvised tool is not going to instantly make you a better fighter. Secours' approach to this topic incorporates the main set of techniques (from access and manipulation, targeting, tracing, and pressure points to structure breaks, striking drills, and low-line attacks) with the most effective use of available weapons, such as keys, flashlights, clothes, books, chairs, and the environment. In short, do not fixate on the weapon; learn how to operate within its limitations, and you'll enhance your defense skills and tactics.